Most people reading this are parents, I'm sure. However, parent or not, chances are you've heard the overused phrase "children are miracles". I have been told this time and time again, but I don't think it ever really sank in until recently. I found myself unexpectedly pregnant young, but after the initial shock wore off, excitement set in and I remembered thinking, wow, I am growing a baby. How cool? After our first daughter was born we felt "blessed" and had a sense of being complete. We then went on to have our second daughter who then made these feelings multiply and grow stronger. It's easy to take the whole getting pregnant, nine months of growing a child, labor, birth and baby routine for granted because the process is so natural and happens hundreds of thousands of times a day all over the world. It's especially easy to take your children for granted once they're born and along comes an endless amount of crying and tantrums, and once they're older; attitude and defiance. For myself anyway, the miracle aspect of having children didn't come to mind until my situation wasn't so "normal" and easy anymore. It's so unbelievably heartbreaking to know how many people have such difficulties having children. On October 5th, 2012 I was in a hospital room on what had started out as one of the happiest days of my life. Laying there, exhausted and sore after a long nine months of a hard pregnancy and a super long natural labor. Holding my baby boy, I was in a trance, staring at the clock on the wall, with blurry tear filled eyes for what seemed like an eternity. The sight of it, now burned into my memory, I remember focusing on the slow ticking hand that was almost taunting me as I counted minute by minute how long it had been since my son was born, and how long it had been since he took his last breath. I couldn't stop thinking about how badly I wanted to rip the clock off the wall and manually change the hands back to when he was alive as if that would change the outcome, but the logical side of my brain (a very small part at this time) kept telling me it wasn't possible. 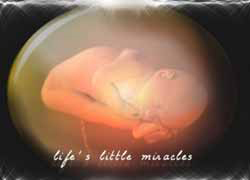 During the months that have followed is when I have most heard the phrase "children are miracles". We have been given no answers or even the slightest guess as to what happened to our "perfect and normal son". The doctors, midwives and coroner have all explained that sometimes, "these things just happen with no explanation," chalked up as a mystery and everyone then goes on to tell me everything that has to take place from conception to birth and what has to come together perfectly for a baby to thrive, as if being given this information would somehow lessen my grief. I am not sharing my story to scare anyone, but more as encouragement for the difficulties that come as being a parent. It's so easy to get wrapped up in the exhaustion from the sleepless nights, the picky eaters, and from the little tornadoes that make a clean house utterly impossible. The countless frustrations of the terrible twos (and threes, and fours, and fives ... my oldest is five so I don't know what happens after this. ), the talking back, little bodies full of attitude and the meltdowns from not being allowed a play date every waking moment of every day. I have learned that children are absolutely 100% a miracle to be thankful for no matter what their mood. Their existence is a phenomenon and their being is obviously so meant to be, with a plan and a purpose. Life is so busy and it is so easy to be consumed by stress, money, your job and everything else that comes up in our lives, but I encourage you today to slow down. Count your blessings, think about what's really important and hold your babies tight while they still let you.